London—This may be the strangest election of my lifetime. Called by Prime Minister Theresa May after she vowed repeatedly that she’d do no such thing, it seemed at first like an assured triumph for the Tories—and possibly the coup de grâce for Jeremy Corbyn’s divided and floundering Labour Party. But six days before the vote, the poll gap has shrunk from 22 points to an astonishing four, with some projections even predicting a hung Parliament. May, too, seems to shrink by the day, hiding behind her “strong and stable” mantra, too scared to take part in the BBC’s televised leaders’ debate (she sent Home Secretary Amber Rudd instead, two days after Rudd’s father’s death), speaking to carefully managed crowds but saying almost nothing. Like David Cameron after the EU referendum, she’s beginning to look like someone who knows she miscalculated, led astray by complacency and a blind sense of entitlement. Corbyn, on the other hand, seems to have found his voice. Always happier on the campaign trail than in Parliament, he comes across as direct, relaxed, and confident. The sanctimonious tinge has gone; so has the nervous pretense of being above the game. He’s being allowed to go for broke and campaign (for the most part) on what he believes. For the first time since the Blair era, the Labour manifesto makes a wholehearted argument against austerity. It promises to restore the welfare state through public investment in the health service, energy, and transport; universal childcare; and free university tuition—to be financed by reversing cuts to corporation taxes and raising taxes for those earning £80,000 or more. Zero-hours contracts will be banned. The minimum wage will go up to £10 an hour. Borrowing will fund a national investment bank for infrastructure development. Labour’s case for the common good comes—refreshingly—with minimal triangulation. Labour’s case for the common good comes—refreshingly—with minimal triangulation. At last there’s no pretense that we can have European-style public services with American taxation levels; there are choices to be made. When a small-business owner asked Corbyn in a televised Q&A why he had made it “impossible” for him to vote Labour as his parents had, Corbyn responded by appealing to his sense of community as well as to his pocket. He pointed out that the country is badly divided; asked if the man was happy to see children going to school hungry; made the case that a living wage would give customers more to spend. As the polls show, I’m by no means the only Corbyn skeptic to be impressed by both the manifesto and the man. But the damage done by months of weak and equivocal leadership is difficult to undo: On the doorstep in our marginal Labour constituency too many (former?) Labour voters say they can’t support him. 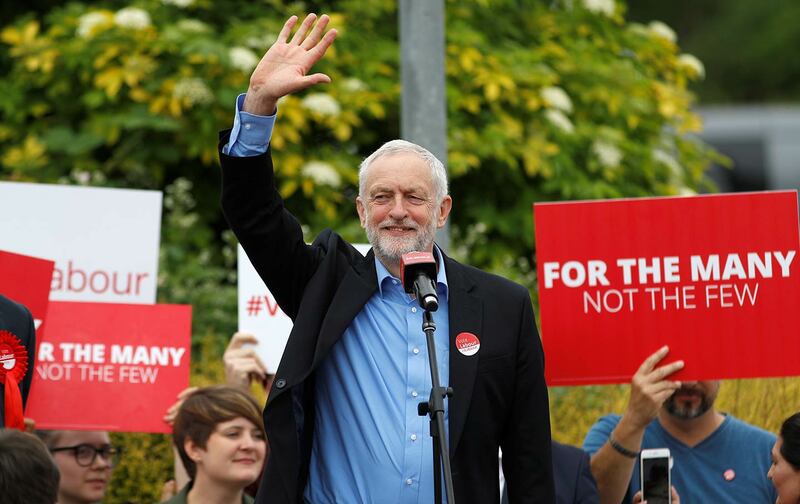 To the better-off liberals, almost all Remainers, who propped up New Labour’s big tent, talk of nationalizations and the drumbeat from conservative media about Corbyn’s weakness on security and defense raise frightening red flags. And the willful neglect of Labour’s traditional base during the long Blair years has left it wounded and hurting. That sense of betrayal can’t be healed by shiny promises; old Labour heartlands are easy prey to the Tories’ pull-up-the-drawbridge politics of fear. In some ways, this election feels like the last of a dying era rather than the first of a new one. A direct consequence of the Brexit vote, this election is the first to be fought on the fragmented, chaotic landscape it revealed. There’s a sense of unreality about the whole proceedings, partly because many of us don’t quite recognize the country we thought we lived in, but also because what happens next will largely depend on the deal Britain gets with Europe. On this too (now that the die is cast) Labour is being more forthright than the Tories; as a left Euroskeptic, Corbyn may in fact have more appetite for the negotiations than May. While May repeats the slogan “No deal is better than a bad deal” and recycles broken promises about limits on immigration, Corbyn is clear that Labour’s priority is to secure tariff-free trade with Europe and protect Britain’s jobs and economy. His style is conciliatory; hers, confrontational. What this will mean in practice, we can’t know. In some ways, this election feels like the last of a dying era rather than the first of a new one, with Labour proposing to revive the old centralized welfare state and the Tories reverting to form as the hard-nosed “nasty party.” And yet, with the world beyond this island also in deep turmoil, the stakes couldn’t be much higher. The most hopeful sign in these last headlong weeks has been the birth of a “progressive alliance”—not just as a tactical voting project but also as a political affinity group that could include Labour, the Greens, the Scottish Nationalist Party, Wales’s Plaid Cymru, and the Liberal Democrats. Labour, the Lib Dems, and the SNP have, of course, ruled out coalition deals, but that’s electioneering. The synergy of those leaders in the BBC debate offered a glimpse of a possible future left politics: pluralistic, cooperative, open, committed to the same values, but responsive to different needs. Could it happen? I don’t know. But even if, as she probably will, she wins on June 8, Theresa May’s absence from that sometimes chaotic, passionate debate and Amber Rudd’s isolation made it clear that they now belong to the politics of the past.